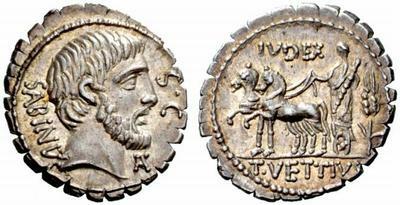 This type has inspired many explanations for what iudex (judge) means on the back of this coin and how it relates to the figure in the chariot (RRC 404/1). I thought I’d throw my had into the ring with a new (? ish?) suggestion. What if the staff being held by figure in the chariot is actually a decempeda or pertica or similar measuring stick associated with land distribution/confiscation/centuriation/boundary disputes etc. This would fit well with themes of Romano-Italic relations on the coinage of these years and obviously the large ear of grain behind the chariot. This may be what the bumps on the staff are attempting to represent. (Click on link above for comparative iconography).